Bernie Sanders’ insurgent campaign for the Democratic Party nomination is beginning to make the establishment of the Democratic Party really sweat. As of the end of September, Sanders is in a dead heat with Clinton in polling in Iowa and 16 points ahead in New Hampshire! Nationally he has cut Clinton’s lead from 34 percentage points to 15 – and down to 7 if Biden enters the race. Sanders’ call for a political revolution against the billionaire class combined with his refusal to take money from corporations or rely on Super PAC money is tapping into the massive vein of discontent and disgust with the corporate political establishment. This, in addition to positions like calling for $15 minimum wage, single payer health care and opposing the Trans-Pacific Partnership has led to Sanders early endorsement by the National Nurses United, and a surge of rank and file support in a number of other unions. Sanders has also substantially strengthened his program on racial justice, police brutality, and mass incarceration and is regularly addressing these issues after being silent in the early stages of the campaign, which, as we said, was a mistake. He is also being more proactive in spelling out his differences with Hillary Clinton for example on breaking up the big Wall Street banks and re-enacting the Glass-Steagall Act. Sanders also points to the important vote to attack Iraq in 2003 as a clear difference between himself and Hillary Clinton. His refusal to give in to the massive pressure from a near constant drumbeat for war is noteworthy. However, we disagree with his earlier votes for war against Afghanistan and the former Yugoslavia. His largely uncritical support for the Israeli state, despite its systematic oppression of the Palestinian people, is particularly egregious. Nonetheless, these positions do not change the fact that hundreds of thousands of ordinary people are being radicalized by his campaign. 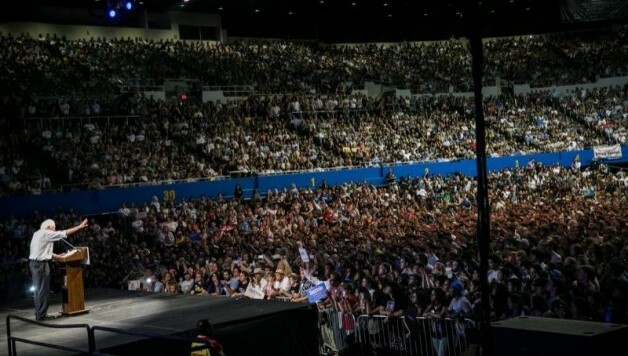 To these hundreds of thousands, including large numbers of young people, Bernie Sanders represents an opportunity to stand up to the billionaire class and fight for fundamental change. As we have repeatedly insisted, socialists and left wing activists should be a part of this movement, not stand aside from it. In particular, we need to address the question facing this movement: how to achieve the key pro-worker aspects of Sanders program that have attracted so many. Sanders says, and we agree, that “the only way we succeed is when millions of people stand up and decide to engage.” But what kind of engagement? Is it just joining the Democratic Party and voting? We say this requires a mass movement in the streets and building a new political force independent of the Democratic Party. The fundamental contradiction underlying the Sanders campaign – running against the billionaire class within the structures of a party thoroughly funded and controlled by them – means that as Sanders become a more serious threat, the question is not if, but when, the gloves will come off. A preview was given by a Hillary-linked Super PAC statement attacking Sanders’ support for socialist Jeremy Corbyn in Britain (see p. 9) and for negotiating with the Venezuelan government under Hugo Chavez to buy cheap heating oil for working people in Vermont. Should Bernie Sanders actually start winning primaries, the Democratic Party machine will not stand aside. The lack of debates is already an indication the leadership is looking to control the primary process to ensure the triumph of a candidate that does not inspire millions to fight against Wall Street. If Hillary looks too vulnerable, sections of the establishment may also push Joe Biden to run as a way of distracting from Sanders’ challenge. The Democratic Party will never carry out a political revolution against the billionaire class. The primaries are dominated by corporate cash and the machine of the Democrats is closely tied to Wall Street. Not a single Democratic Senator supports Sanders and the so-called super delegates – party officials and elected representatives – are already being lined up against him. The better Sanders does, the more this will be revealed. Sanders should not stay within the straightjacket of the Democratic Party, which will, at the first opportunity, cut off his political revolution. Should he lose the primaries, it would be an enormous mistake for Sanders to direct his supporters to support Hillary Clinton or any other Democratic nominee under the control of Wall Street. In such a scenario, the best option to build toward Sanders’ program of $15, single-payer health care, as well as toward activating working people in their own interests, is to support the strongest independent left challenger: most likely Jill Stein of the Greens. If he somehow won the nomination, despite all the obstacles, he would face the unremitting hostility of the Democratic Party apparatus. Either way, it is urgently necessary to use Sanders’ campaign to begin taking steps toward what we really need: a new political force independent of the Democratic Party, connected to mass movements in the streets like the fight for 15 and Black Lives Matter. This is how we really start a political revolution with the potential to not only win Sanders’ progressive platform, but to break the corporate grip on our political system.